The CMS released a proposed rule Friday that would implement parts of the 2018 budget deal, including allowing Medicare Advantage plans to offer government-funded telehealth services to seniors starting in 2020. Under the proposed rule, Advantage plans would be able to offer telehealth services to all plan members, regardless of where they live, and would have greater flexibility in how they pay for telehealth benefits. 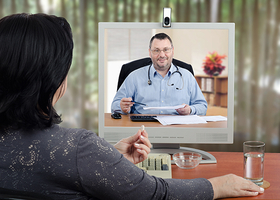 It also allows Medicare Advantage members to receive telehealth at home. The traditional fee-for-service Medicare program restricts telehealth services to certain sites in rural areas. "President Trump is committed to strengthening Medicare, and an increasing number of seniors are voting with their feet and choosing to receive their Medicare benefits through private plans in Medicare Advantage. Today's proposed changes would give Medicare Advantage plans more flexibility to innovate in response to patients' needs," CMS Administrator Seema Verma said in the announcement. Medicare Advantage plans can offer telehealth as a supplemental benefit now, but the proposed rule would allow as part of the basic benefits package telehealth services beyond what is available in the traditional Medicare program. The change means telehealth benefits would be accounted for in the CMS' payments to Advantage plans. Beyond the telehealth changes, the proposed rule would consolidate the appeals processes across Medicare and Medicaid to make it easier for enrollees in certain dual-eligible special needs plans to navigate the system. It would also require health plans to more seamlessly integrate benefits across the two programs for more coordinated care. The proposed rule would also update the methodology for calculating Medicare Advantage plan star ratings to improve stability and predictability for plans and adjust how the ratings are set during uncontrollable events such as hurricanes. The CMS also wants to make changes that it said will help the agency recoup overpayments to Advantage plans. The changes would save the Medicare program about $4.5 billion over a 10-year period by recovering improper payments through risk-adjustment data validation audits. The CMS said it will accept comments on the proposed rule through Dec. 31.